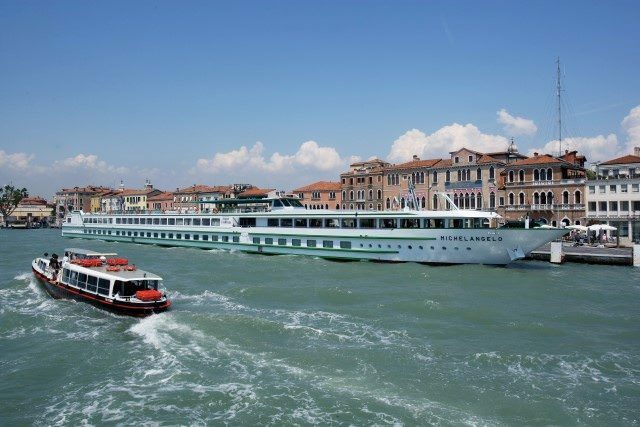 CroisiEurope’s Michelangelo sails Italy’s Po River. Photo courtesy of CroisiEurope. Constructed in 2000 and extensively refurbished in 2011, CroisiEurope’s Michelangelo sails Italy’s breathtaking Po River from the famous Italian city of Venice. With its numerous canals and historic lagoon, it’s easy to understand why travelers have been flocking to this region for centuries. Michelangelo is 361 feet long and can carry a maximum of 158 guests and features three passenger-accessible decks: Sun Deck, Upper Deck and Main Deck. 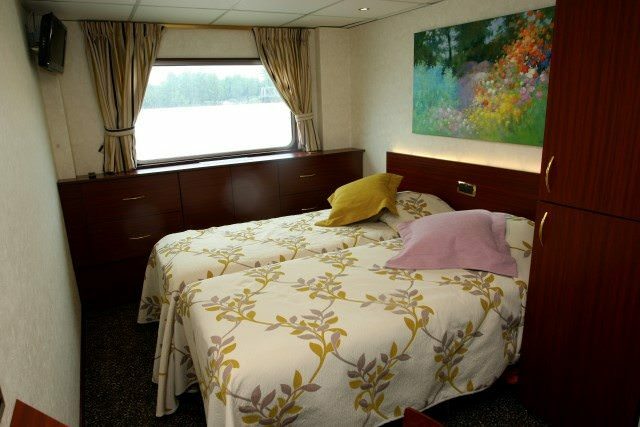 Staterooms aboard Michelangelo are modern and inviting. 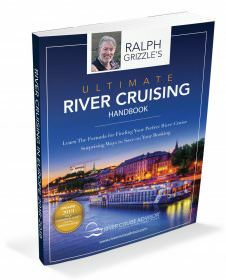 Photo courtesy of CroisiEurope. Each of the 78 staterooms available aboard Michelangelo nearly identical in size and amenities. Their main differences lie in their physical placement on the ship’s two passenger decks. Staterooms on Upper Deck and Main Deck all have fixed windows. 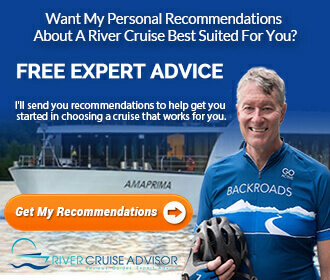 Each stateroom includes a private bathroom with shower, toilet and sink/vanity area; a hairdryer, personal safe and a satellite television set. Unlike other ships in the CroisiEurope fleet, there are no mobility-impaired staterooms aboard Michelangelo, though two staterooms at the forward end of Main Deck have been set aside for single occupancy, while a further four cabins on Main Deck can accommodate three guests. The Main Restaurant aboard Michelangelo serves up breakfast, lunch and dinner. Photo courtesy of CroisiEurope. 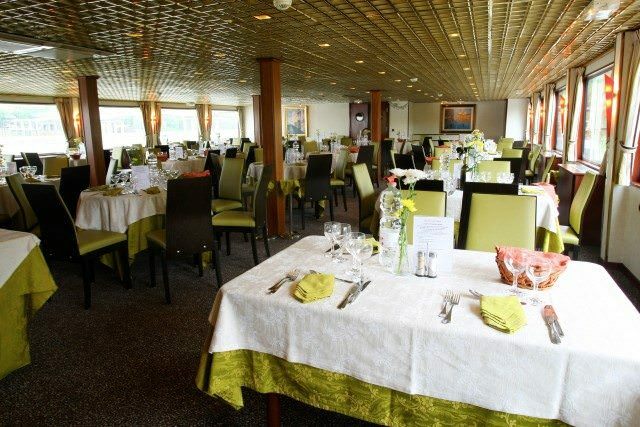 Aboard Michelangelo, all public rooms are located on the ship’s Upper Deck. A main Restaurant located all the way aft serves up meals buffet-style for breakfast, with a set menu that changes daily for lunch and dinner. The Restaurant has an intimate feel and encourages socialization with a variety of table sizes. All the way forward on the same deck is the Main Lounge aboard the Michelangelo. This features 180-degree panoramic windows that look out on the stunning scenery passing by. With a full-service bar, it’s a great place to relax and enjoy newfound company. The Lounge also features a decently sized dance floor that becomes well-used as the night wears on. On the Sun Deck, located one deck higher, guests can admire the passing views of Italy’s Po river and the historic canals of Venice with outdoor deck space that stretches from bow to stern. Electrical outlets onboard use standard two-prong, European 220V connections. North American travelers will require an adapter and/or converter to use electronics. There is no passenger elevator aboard Michelangelo. There are no French balconies aboard Michelangelo. There are no mobility-impaired staterooms aboard Michelangelo. Wi-Fi and Internet connectivity are available onboard for an additional fee.